I once considered the Ram 1500 as the best pickup sold in this country – period. Two things happened. First, a rash of quality issues and recall notices. Just when you thought Fiat Chrysler Automobiles was making a standout pickup, things began unraveling. Sad, really – it was a great pickup truck. It still is. The second was a broadside to Ram and everyone else. When Ford introduced their latest F-150, they touted an all-aluminum cab and box built on top of a rolled-steel frame. Some had predicted that Ford could fail with this new construction for its most popular vehicle. Instead, it extended its lead above all vehicles sold in North America because of the new construction of its half-ton pickup truck. How do they counter the leaner, meaner Ford? FCA had their next Ram 1500 on the drawing board. All they had to do was to make it better than ever. The first thing they did was to find a way to lose weight. 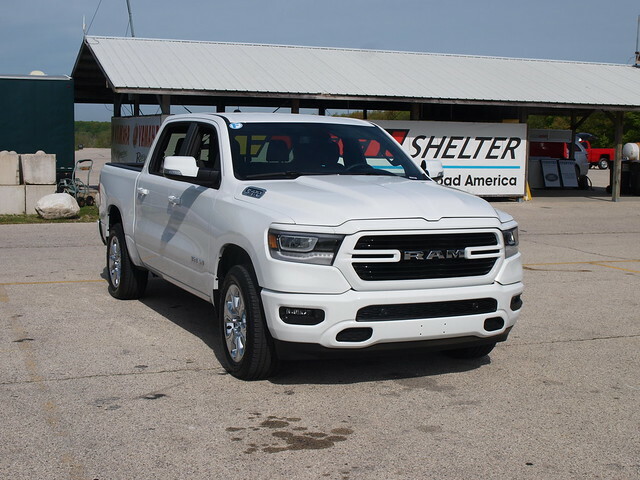 By mixing component materials on the cab and box, while maintaining a strong rolled-steel frame underneath, FCA claims a weight loss of 225 pounds compared to the 2018 Ram 1500. Meanwhile, they were able to add a new mild hybrid system to both their Pentastar V6 and HEMI V8 engines, called eTorque. This is driven from the engine belt to induce more torque above the regular engine while returning more capacity for towing and payload and better fuel efficiency. Back in May, I drove a few Ram 1500s. Two of them were at the 2018 Midwest Automotive Media Association Spring Rally held at Road America in Elkhart Lake, Wisconsin. I drove the third one at a dealership in Eau Claire, as well. 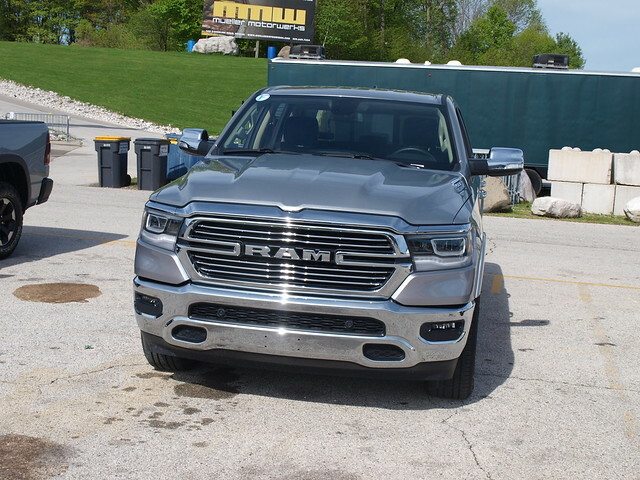 For this Quickies review, I want to concentrate on two Ram pickups driven at the MAMA Spring Rally, as they both represent the equipment level and specification that most consumers would most likely purchase. To be fair, both Ram 1500s were specified almost the same. They had the 5.7-liter HEMI V8 engine without the eTorque on board, along with 8-speed automatic transmissions and four-wheel drive. Both models were also crew cabs with the short box. The difference was in the trim levels – one was a Big Horn, the other was a Laramie. 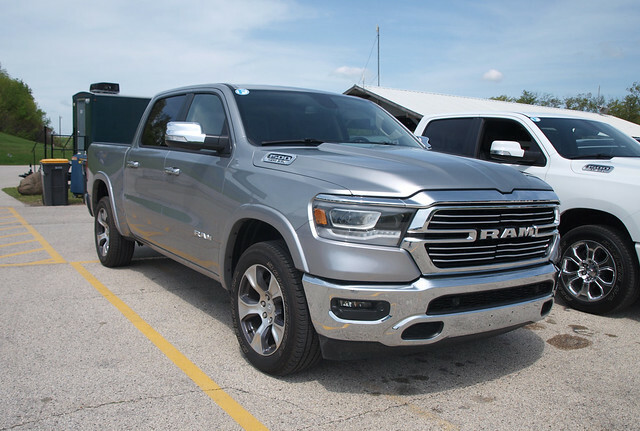 Having two similarly-specified pickup trucks helped to get an overall view of the 2019 Ram 1500. I came away with similar thoughts on each one. Starting with the exterior, which has been changed towards creating a new brand look. This may seem evolutionary, but one would find where Ram/FCA stepped up to make it distinctive. While the “big rig” front is apparent, the grille and headlamp areas were slimmed down for a sleeker look up front. Everything else rearward seemed evolutionary, but with added styling to separate the two generations. In all, it is both handsome and distinctive, especially when put next to the Ford F-150 and the 2019 Chevrolet Silverado. FCA also stepped up in their award-winning cabin. The Big Horn offered cloth seating, which was comfortable; the Laramie had a nice leather upholstery that was both useful and luxurious. Neither had the 12-inch Uconnect screen that FCA had been touting in the auto show circuit. They both had the popular 8.4-inch version of the same screen – and it might be the right choice for consumers. The 12-inch screen will eliminate key controls underneath it, which may confuse plenty of consumers used to tangible climate and audio controls. The solution is to specify the 8.4-inch Uconnect screen with navigation to get the full benefit of control in the new Ram 1500. Otherwise, the seats are very comfortable. They are truly made for work, play, and long drives for either/or. In the Crew Cab, the rear seat is tremendous. Again, the big difference between the two Ram 1500s is the trim level. The Big Horn has a useful feel to it, while the Laramie is near-luxury. Yet both have high levels of quality materials and build inside, along with a superior design for the driver. The available “regular” 5.7-liter HEMI V8 was equipped on both trucks. Based on other V8-powered Rams I worked with in the past several years, I felt something different about these trucks. The weight loss helped to give the V8 more power and control. It feels much better – not constrained to be “just right” for the truck’s specification. The 8-speed also felt smoother, though they did move the eShift controller to the dashboard. I’m not sure whether it is in the right place – or the right shifter to use. Ride quality has always been good, being that it is the only pickup truck with independent suspension at all four corners. The available air suspension is retained, which enables the Ram 1500 to lower the truck automatically at highway speeds for more efficiency. With the normal set-up, it still rides well without a lot of feedback from the road. Plus, it handles and corners quite well – near-flat through the corners at proper speeds. It helps to have a good steering system and brakes on board, too. The Big Horn came out to $51,710, while the Laramie was priced at C$74,785 (yes, that latter model was a Canadian market vehicle – no joke!). Starting price for the 2019 Ram 1500 lineup is $31,695. The toughest question to ask is whether the 2019 Ram 1500 is the best in its class. Right now, yes, but it needs to get over a few initial humps to prove its longevity and staying power. The last generation Ram 1500 still serves its owners well, even through some recalls. 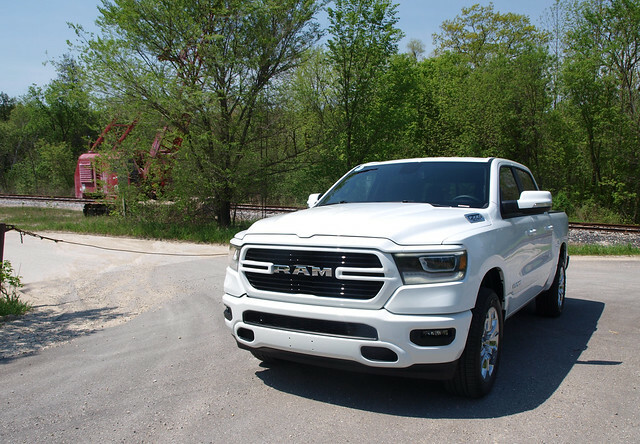 As General Motors starts delivering its 2019 pickups and Ford adding more to its “bar,” the job of the 2019 Ram 1500 is to fight back at every corner. This following model year should prove to be interesting for Detroit’s Three.